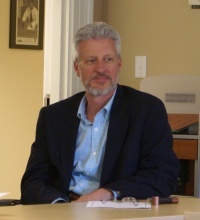 Born and raised in Richmond, Virginia, Wayne Cilimberg moved to Charlottesville in 1989 while working for the County Department of Planning and Community Development. He graduated from Virginia Tech first with a BA in Urban Affairs in 1976 and then with a Masters in Urban and Regional Planning in 1981. ↑ Web. Resolution recognizing Wayne Cilimberg for service to the County, April 6, 2016 Board of Supervisors agenda, County of Albemarle, retrieved April 1, 2016. ↑ Web. Meet your government: Wayne Cilimberg, Charlottesville Tomorrow, April 28, 2012, retrieved June 22, 2012. This page was last edited on 6 April 2016, at 11:18.